Like his stable companion Roy Wright, Windy City singer Ray Pettis, who was born on 1 October 1930, started his career with the legendary Drexel label. Pettis was the lead singer for the Gems whose 45s are eagerly picked up by doo-wop collectors. His soft well modulated high baritone with it's easy going tone and fine phrasing can also be heard on his solo 45s on Drexel. 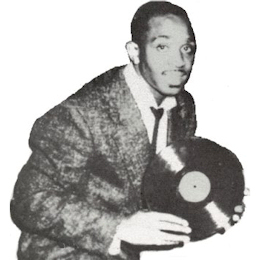 By the end of the 60s Pettis had joined the Foster Brothers with whom he recorded half a dozen more doo-wop singles before finally choosing a solo career. 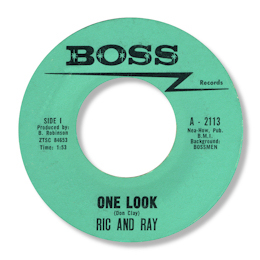 Pettis joined Don Clay and Bobby Robinson (the Chicago entrepreneur not the New York-based record man) who issued a solo 45 on their Boss label, and a duet with Ric Lee. These were more in the doo-wop line than "in the alley" R&B, but as the 60s moved on Pettis developed a more gritty, hard hitting tone which suited the new soul styles rather better. 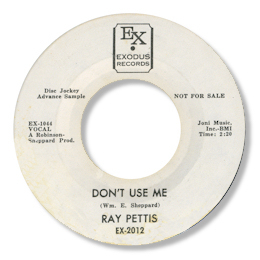 Both sides of his Teako/Salem Release were strong Chitown soul with a good funky backbeat, and his Exodus release continue that trend with the best of this type "Don't Use Me". The flip to this was an unusually jazzy item which has had some interest from DJs. 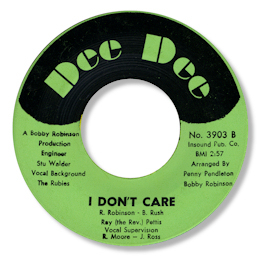 I think his best work, however, came with his final 45s for Robinson's Dee Dee label. "Together Forever" is a fine piece of midtempo Chicago soul but the flip is even better. Think It Over is a well orchestrated ballad on which Pettis sounded really at home, and this artistic success was continued with the toe tapper "Hello There Pretty Baby" which had a feel similar to that generated by Tyrone Davis at the time. The other side, I Don't Care is a very well produced waltz time ballad with a really attractive bluesy edge to it. I'm not aware that Pettis recorded after those Dee Dee releases but he continued to work in Chicago right up to his death in 1991. UPDATE ~ Tom Casey has written to say "Your fine coverage of Ray omits one gem, his smooth, infectious vocal to "That's All", on the David Rockingham Trio's Dee Dee 45 (D 1000 from 1958, backed with DTR's snappy instrumental, "Dawn")." I'm grateful to Tom for this info - on listening to the track he mentions Ray certainly does sound fine on this cut. Note ~ Non-group recordings only. There is more info on Ray, particularly his time with the Gems, on Marv Goldberg's excellent site here.